In 1975, the Khmer Rouge overthrew the government of Cambodia. Over the next four years, the communist political party embarked on a mission to radically alter the population of Cambodia. Party members believed all citizens should work together on collective farms, and anyone who did not agree or who did not fit into their new vision of society had to be eliminated. By 1979, an estimated two million people—over 20% of the population—had been killed, either worked to death or simply executed. Now nearly four decades have passed since the Khmer Rouge was defeated by Vietnam in 1979, bringing an end to the genocide. Yet, new information is continually brought to light, and those who orchestrated the violence are only now being tried in a United Nations-assisted tribunal. Here, Hollie Nyseth Brehm talks to Keith Chhe, a survivor of the genocide. Hollie Nyseth Brehm: Can you tell me about your life before the Khmer Rouge came to power? 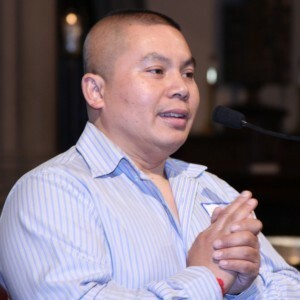 Keith Chhe: I was born in 1967 into a family of 12 children, so I was only a child before the Khmer Rouge came to power. Like the majority of Cambodia, my parents were very devout Buddhists. My dad was a judge, and my mom worked in business. My days were spent running around the house with my brothers and sisters. Our home was always filled with my cousins and neighbors. So, when we sat down to dinner, about 20 people would be seated around the table. It was wonderful—like a party every day.Before the Khmer Rouge… our home was always filled with my cousins and neighbors. … It was wonderful—like a party every day. NB: How did life change when the Khmer Rouge came to power in 1975? KC: I remember mass chaos. Khmer Rouge soldiers took over cities, and their first order of business was to evacuate them. So, imagine you live in New York City, and suddenly a communist army takes over and institutes martial law. People carrying guns tell you that you must leave. And if you don’t cooperate, they just shoot you on the spot or burn your home to the ground. NB: How did your family react? KC: That day, my dad told us that we had to leave our home. There was a sea of people walking down the road—for miles and miles—because hundreds of thousands of people were being evacuated from our city. People left because they had no choice. A few people tried to get back into the city to find their families, though they were shot. Others—including the man who had been walking right next to me—were shot to display the power of the Khmer Rouge. NB: That had to be so confusing as a child. KC: I didn’t understand. I didn’t know why we had to leave or why we all were being pushed out of the city like cattle. We just kept walking, and thankfully, my family was able to stay together. We walked until we were in another province. There, the Khmer Rouge forced everyone to work in labor camps. They separated people by age and gender and sent them to perform different kinds of agricultural work. So some people were building dams, while others were working in rice fields or growing fruits and vegetables. We worked over 16 hours a day and were given little food. We were not allowed to grow our own food, as all land belonged to the government. If you tried to keep any of the food you harvested, members of the Khmer Rouge would kill you. NB: And what was your job? KC: Between the ages of 8 and 12, my job was to raise cattle and take care of the water buffalo. We would take them out to graze during the day, and, at night, we would take them to the river to drink and bathe. Despite working such long hours and starving, some days almost felt normal. Other days we were reminded of what was happening because, at night, we would see dead bodies floating down the river as we were washing the water buffalos. Hundreds of floating bodies—sometimes even children, babies, or pregnant women. And we knew the Khmer Rouge had killed them somewhere up river and pushed them down a cliff. NB: Who was the Khmer Rouge targeting? KC: The Khmer Rouge saw people as either “new people” or “old people.” The “new people” were the ones who were evacuated from cities to work in the country; these were typically well-educated people, business owners, people who were seen as having lighter skin, and former government employees. If you sided with the Americans during the Vietnam War, which was taking place in our neighboring country, you were also the enemy because you opposed communism. On the other hand, the “old people” had previously worked in the countryside as farmers. They were favored by the Khmer Rouge, and the Khmer Rouge recruited them to work for the government.Imagine you live in New York City, and suddenly a communist army takes over… if you don’t cooperate, they just shoot you on the spot. NB: And the government systematically killed the “new people”? KC: Many people died of starvation working the fields, but others—particularly those who were educated above an 8th grade level or worked for the previous government—were killed systematically. There were even execution lists. Sometimes members of the Khmer Rouge took people to killing areas, such as trenches or cliffs. The method of execution there involved hitting people on the back of the head with an AK-47, hoe, or axe so as not to waste ammunition. They would shoot you if you tried to run, though. NB: How absolutely terrifying. I imagine that, at the time, this was hard to understand. It still is. But, as you reflect back, do you have ideas about why this genocide happened? KC: You can find its roots centuries ago in the French Revolution, because this is when nationalism was invented. Nationalism is one way of creating divisions between people; people are propagated to believe their nation is superior to others, even though nations result from lines… drawn on a map. To this day, we create divisions based on “nation” and many other categories. This is often over-simplified; in Cambodia, people were reclassified into the two groups I mentioned, and one group—the “new people”—was seen as the enemy. NB: That’s very sociological—the idea that even though race, ethnicity, nation, and other factors are socially created, they can have very real consequences. How did you ultimately escape this violence? 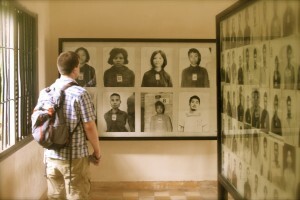 A visitor at the Toul Sleng Genocide Museum. Photo by KidsLoveAnimals, Flickr CC. KC: In late 1979, my family decided to try to join many others who had attempted to flee. By this time, my father and two oldest brothers had been executed. So, we decided to risk leaving before others were killed, and we had enough jewelry [the operating currency at the time] to take a truck ride to the border with about 50 other people. …About one kilometer from the border, the truck driver told us he could go no further due to the land mines and violence. There was a refugee camp about a kilometer or two away, and the driver instructed us to wait until there was no gunfire and run without looking back. So, we began to make our way off the road, through the rice fields toward the border. We moved when we thought the gun fire had subsided, but, all of a sudden, we heard it all around us. We scattered, and I held onto my younger brother as we ran for our lives. Bullets were flying everywhere. At one point I thought I had cut my leg on a broken twig, but we kept running. NB: And you made it across the border? KC: We saw smoke almost like a campfire, and we ran until we reached it. We had made it to the camp, but we realized right away that I had not been hurt by a twig—I had been shot. Within minutes, we were in a Jeep. I never let go of my brother’s hand. As the Jeep drove, I saw large fields with big white tents and refugees everywhere. We arrived at a tent with a large red plus sign, and a few people carried me inside. A nurse told me she was going to put a needle in my arm to stop the pain, and then I was out. NB: Were you able to reunite and recover with your family in the camp? KC: Two days later, my younger brother and I were miraculously reunited with some of our family. After recovering, we were transferred to another camp. The conditions were terrible and we were starving, but we were mostly together as we waited to leave the camp and emigrate to the United States. NB: When were you finally able to obtain refugee status in the U.S.? KC: I immigrated to the U.S. in 1981 with three of my brothers and my sister. The rest of my family is in Cambodia, Canada, and the Czech Republic. We went from one big happy family around a dinner table to being broken. And to this day, we have yet to find out where the Khmer Rouge took my father and my two oldest brothers. We never found the place of their execution, so their remains [can] never be laid to rest.We must elevate education so that we all may live in peace and harmony. I believe that only through education, respect, love, kindness, and humility will we abolish genocides. NB: Beyond shattering your family, how have these events impacted your life today? KC: It has been really hard to live apart from my family. But these events have motivated me to help others who were affected by the atrocities. The genocide took so many lives and has had lasting demographic effects on Cambodia. Out of 15 million people living there today, 50 percent are under the age of 22. That’s over 7 million young people who are in dire need of proper education. But, most families survive on less than one dollar per day—less than a small cup of coffee in our corner store. NB: How do you help? KC: I serve on the board of directors of Global Children Cambodia, a nonprofit founded by Laura Sackler Tancredi. We help underserved children gain access to higher education and performing arts, thereby empowering Cambodia’s next generation. In fact, our mission reminds me of my father. Buddhist temples in Cambodia open their doors to all who seek refuge; and as young man, my father was allowed to live in the temple for free while pursuing higher education. This was the only way he was able to afford school, and it’s this spirit that motivates Global Children Cambodia. We provide meals, housing, health care, English education, computer education, motivation, and other support to the underserved Cambodian children. NB: That’s amazing. Is there anything else you would like people to know? KC: I will only say that I wish my nightmarish experience will never happen to another human being again. We must elevate education so that we all may live in peace and harmony. I believe that only through education, respect, love, kindness, and humility will we abolish genocides. Hollie Nyseth Brehm is in the sociology department at The Ohio State University. She studies criminology, genocide, and international law and volunteers with the Center for Victims of Torture. Keith Chhe lives in upstate New York, where he owns a construction company and karate studio. Thank you for sharing this story. Since I have known Keith, as a fellow board member, I continue to be impressed and amazed at how his experiences, have motivated him to respond to extreme violence with love and compassion. It could be easy to blame others or to respond to violence with violence. Thank you for this story, it is a pleasure to be working with Keith, and understand how such compassion and energy can be forged in the heat of extreme violence, murder and injustice.